All Tech Heating & Chimney Service technicians have been providing Victoria, BC with gas burning fireplace solutions for over 10 years. Our gas fireplaces, inserts and stoves offer warmth, character, efficiency and create a wonderful conversation piece within your home. 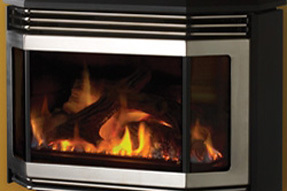 We work closely with you to select the gas fireplace best suited to your home and taste. Our quality manufacturers have combined the classic appeal of past design with modern efficiency A traditional wood unit built around the turn of the 20th century, has an efficiency rating of around 40%. This is a respectable number when you compare it to the 5% - 10% efficiency rating of a traditional open fire place, but a modern gas unit has them all beat.With a modern propane or natural gas stove or fireplace you can expect to see an efficiency rating that approaches 90%. Upgrading to a new one can save you money on fuel over the long haul while also making better use of our natural resources. Give us a call today to talk to one of our knowledgeable technicians regarding your next gas burning fireplace, insert or stove. 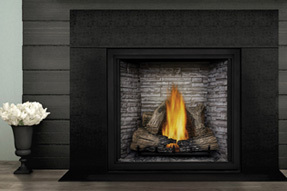 With Archgard gas fireplaces, our flame can be seen throughout the entire firebox. The combination of our innovative burner design and unique log sets allow us to give you the look and feel of a traditional wood fire, complete with glowing embers.